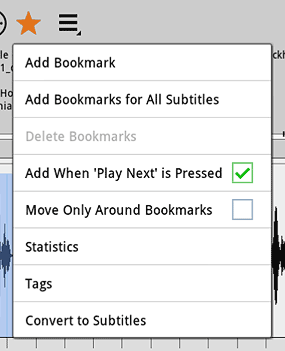 This function in WorkAudioBook has a clear difference from other players – to add a bookmark you need to choose "tag". 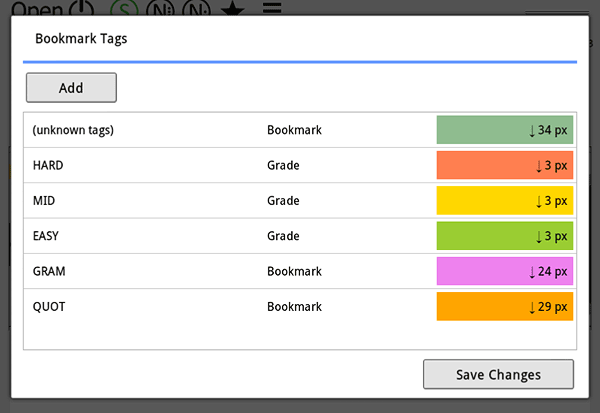 Tag will help you later to find a certain kind of bookmarks: difficult phrases (tag "HARD"), phrases with interesting grammar (tag "GRAM") or interesting quotes (tag "QUOT"). Delete: press for a couple of seconds on a bookmark, the pop-up menu appears, choose "Delete". Or choose "Delete Bookmarks" item in "Bookmarks Actions menu", to delete bookmarks in the selected area. Go to bookmark: press "Go" button, choose "Bookmark" menu item. When you first listen to the file, choose "Add When 'Play Next' is Pressed" option in "Bookmarks Actions menu". 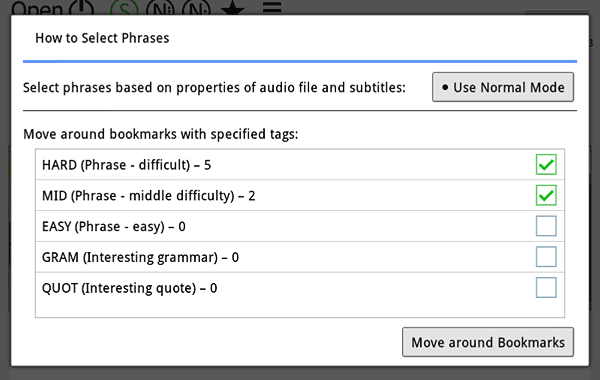 With this option, when you click "Play Next" button, application will automatically show "Add Bookmark" window and ask you to evaluate the difficulty of a phrase that you just listened to. Choose your grade: HARD, MID or EASY. If together with an audio file, you opened subtitles, then in the field "Text" you'll see the text of the current subtitle, in order to evaluate the correctness of your understanding of audio. If you have subtitles of good quality, it makes sense to choose "Select phrases: Exactly as subtitles" option in Settings. Before the first listening you can mark all subtitles with bookmarks with "HARD" tag. Choose "Add Bookmarks for All Subtitles" item in "Bookmarks Actions menu". The most efficient way of creating subtitles is to use Subtitles Editor in Windows version of WorkAudioBook. However, you do not always have time to sit at a computer, so let's examine how to create subtitles in the Android version with the help of bookmarks. STEP 1. Copy text into "Notes for file". I recommend to do this in Windows version. Then copy the notes file together with MP3 file to your phone or tablet. STEP 2. Choose "Add When 'Play Next' is Pressed" option in "Bookmarks Actions menu". With this option you do not need manually select "Add bookmark" command after listening to each phrase. STEP 3. 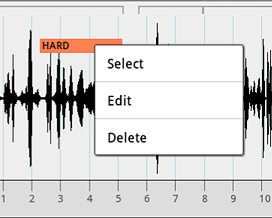 Listen to the first phrase and select text of the phrase in the Notes for File. Press "Play Next" button. The application will show Add Bookmark window, which will contain the selected text. 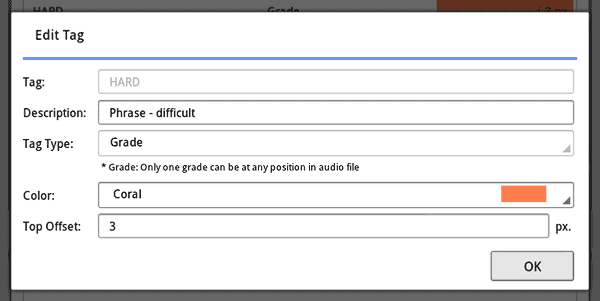 Press at any grade, for example "HARD". Listen to the next phrase and repeat STEP 3. Press "Convert" and the subtitles are ready! Choose "Tags" item in "Bookmarks Actions menu". "Bookmark Tags" window appears. 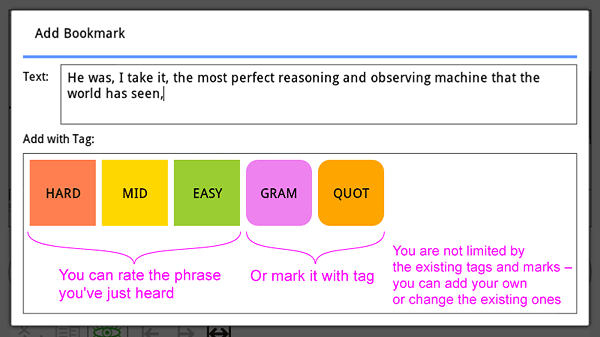 There you can customize tags according with your learning methodology. To edit a tag press on it.